The U.S. government has sent a letter to all 50 states asking them to align state and local laws with the Joint Comprehensive Plan of Action (JCPOA) that the United States and other nations negotiated with Iran. This post provides relevant background, explains why the U.S. government asked for rather than mandated and end to state sanctions related to Iran, and suggests that the JCPOA might eventually require the U.S. government to argue that some (though not all) of the state sanctions are preempted. On January 16, 2016, the Islamic Republic of Iran and the P5+1 (China, France, Germany, the Russian Federation, the United Kingdom, the United States, and the High Representative of the European Union for Foreign Affairs and Security Policy) implemented the JCPOA. The agreement is non-binding under international law. The essence of the deal is that Iran would eliminate its non-peaceful nuclear development activities in exchange for the lifting relevant UN Security Council sanctions, as well as relevant multilateral and national sanctions. The US government has now lifted federal sanctions. But many sanctions based on state law remain. 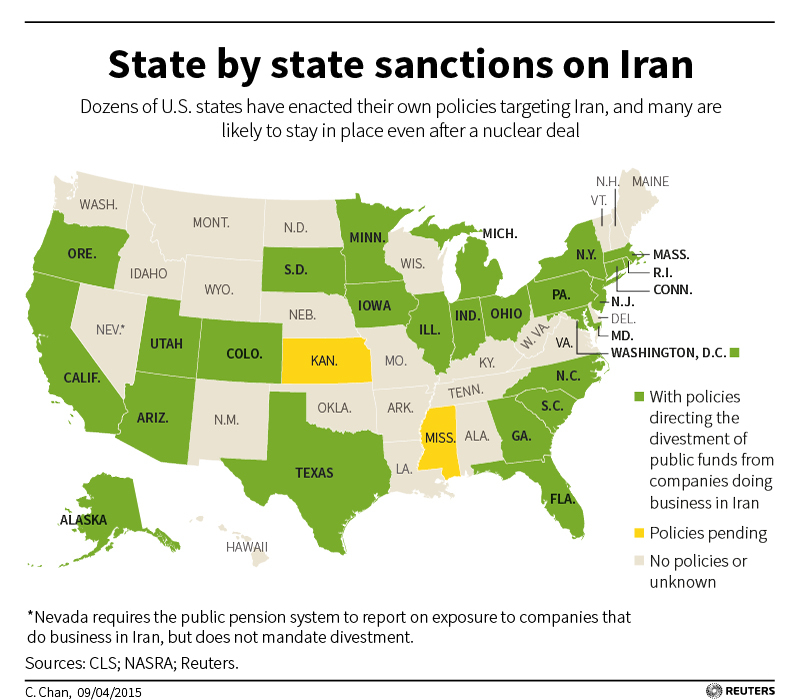 As of last September, between 24 and 30 states had policies that direct the divestment of public funds from companies that do various forms of business with Iran, and impose related sanctions. (See also this map.) Last August, one month after the JCPOA agreement was concluded, Illinois Governor Rauner and other Illinois lawmakers said they were not interested in changing laws that bar the state from doing business with companies that have ties to Iran. Legislators in Georgia, Florida, Michigan, and California shared that sentiment. Dozens of state and local Iran divestment laws remain on the books. Some states have adopted laws designed to incentivize Iran to change its behavior in certain ways. If that is the case in your state, I would urge you to consider whether the implementation of the JCPOA, which verifiably ensures that Iran's nuclear program is and will remain exclusively peaceful, addresses the underlying concerns with Iran articulated in your state’s law. It may also be the case that the sanctions lifting in the JCPOA affects how your state agencies implement such state laws. For example, I understand that some states prohibit contracting with companies that engage in transactions with Iranian entities that are designated as a sanctioned entity by the Department of the Treasury. If that is the case in your state, I would urge you to review the relevant sanctions lists, as there have been significant changes and a number of Iranian individuals and entities have been removed as a result of the JCPOA. … In addition, some state laws require divestment from non-U.S. companies that are involved in Iran’s energy sector. In light of the U.S. lifting of secondary sanctions with respect to Iran’s energy sector, on January 16, 2016, I would encourage you to review whether Illinois’ law might be affected by these changes. The most notable aspect of this letter is that is it “urges” and “encourages” but does not mandate states to review and alter their sanctions related to Iran in light of the JCPOA. This is the minimum that Article 25 of the JCPOA requires. Clearly any state or local sanction related to Iran that meets the specific criteria of Section 202 (i.e. related to a firm that invests $20 million or more in Iran’s energy sector) is not preempted. We have not read every (or even most) state and local Iran divestment laws, but several sources suggest that many state and local Iran sanctions laws fall outside CISADA—either because the sanctioned firms invest less than $20 million in Iran’s energy sector, or because the sanctions relate to non-energy investments. The proper question is thus: Are these extra-CISADA state and local sanctions preempted? One might have thought Garamendi would support “presidential policy” preemption of the extra-CISADA sanctions. The JCPOA imposes more significant reciprocal duties on the United States than did the German Foundation agreement at issue in Garamendi. And the content of the President’s foreign policy in the JCPOA is by any measure more significant than the content of the Foundation agreement. Yet we doubt Garamendi compels preemption. The Foundation agreement was a pure Executive agreement binding under international law that fell within a long tradition of Executive branch settlement of claims with preemptive effect. By contrast, JCPOA is a political commitment that does not bind the United States under international law and that does not concern a topic traditionally capable of binding unilateral executive branch settlement. Garamendi’s holding drew on the President’s traditional power to settle claims by Executive agreement, and is limited to presidential policies that arise in that context. Such pure executive agreements are limited to a relatively few discrete subject matter areas (like core military affairs in addition to the settlement of claims.). Non-binding political commitments like the JCPOA, by contrast, can be made on any topic precisely because they are non-binding and thus fall within the president’s much broader powers of foreign communication and diplomacy. Extending preemptive force to presidential policies in political commitments means unmooring presidential preemption from topics traditionally subject to pure executive agreement and thus potentially extending presidential preemption to any topic. For these reasons any attempted preemption of state laws due to the presidential policies embodied in the JCPOA would involve a large extension of Garamendi. The Supreme Court’s decision in Medellin makes pretty clear that the Court is uninterested in any such extension. There the President argued that Garamendi supported a Presidential Memorandum that sought to implement an ICJ decision in a manner that would preempt state law. The Court rejected the argument. It treated the preemptive power of agreements concerning the President’s claims settlement authority as a “narrow and strictly limited” one that rested on a more than 200-year old practice. By contrast, the Presidential Memorandum that sought to implement the ICJ decision had no such pedigree and could not be the basis of preemption. While there are several differences between the JCPOA and the legal instruments at issue in Medellin, the message of Medellin is that Garamendi should not be construed broadly and that the President lacks independent preemptive power outside of areas of long-recognized presidential agreement-making. To say that Garamendi-style presidential policy preemption is unavailable is not to say that the extra-CISADA state laws can withstand all federal preemption. The federal statutory sanctions that Obama waived might preempt the state sanctions related to Iran under the logic of Crosby. That decision held that federal Burma sanctions preempted state sanctions related to Burma because (among other reasons) (1) the federal law’s conferral of presidential discretion to waive sanctions would be undermined if related state sanctions persisted, and (2) the state law interfered with Congress’s intention to limit economic pressure against the Burmese government to a specific range. These same reasons apply pretty straightforwardly to the federal sanctions against Iran. We cannot say for sure that the federal statutory Iran sanctions preempt the extra-CISADA state sanctions under this logic because we have not examined each of the many federal laws to see if any indicate that Congress wanted to allow state sanctions to persist. But absent such indications, these two factors in Crosby suggest that the extra-CISADA state and local sanctions must fall because they stand as an obstacle to the federal sanctions scheme. One factor in Crosby might cut against this conclusion, however. A third reason for preemption in Crosby was that the state sanctions were “at odds with the President’s intended authority to speak for the United States among the world’s nations in developing a ‘comprehensive, multilateral strategy to bring democracy to and improve human rights practices and the quality of life in Burma.’” The Court read the federal Burma sanctions law specifically to invite the President “to speak for the Nation with one voice in dealing with other governments” on the issue. We have not done a comprehensive search, but a quick scan of the federal sanctions on Iran discloses no such invitation by Congress in that context. On the other hand, one could view CISADA to support preemption of extra-CISADA state sanctions to the extent that it expressly rejected preemption of only a portion of state and local sanctions. And while the “sense” of Congress in CISADA implied (uncertain) general support for state and local divestments laws, that support extended only “as long as Iran is subject to economic sanctions imposed by the United States,” a circumstance that with regard to the JCPOA-related extra-CISADA sanctions may no longer true. A complete analysis of whether the extra-CISADA state and local Iran sanctions survive preemption would require a much more detailed look at the many state and federal statutes in play. But we believe we have shown enough to establish that the U.S. government could try to wield the stick of preemption against some state sanctions under the authority of Crosby. Iran might eventually insist that it do so. After all, in the JCPOA the United States assumed an obligation—albeit a legally non-binding one!—to “take appropriate steps, taking into account all available authorities, with a view to achieving” implementation the sanctions relief required by the JCPOA. To the extent that extra-CISADA state sanctions are an obstacle to the achievement of the sanctions relief pledged by the United States in the JCPOA, Crosby appears to be an available authority for preemption.